That’s the advice Ryan Dowd, owner of an online surf apparel store, would give to his best friend, or anyone thinking about venturing into the entrepreneurial world. 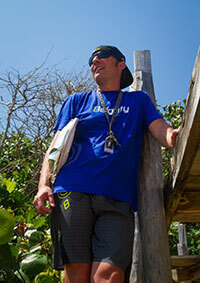 Ryan is one of the visionaries behind the surf wear company 8eighty Wear. This article tells the story of how Ryan and his team transitioned from corporate America to the entrepreneurial lifestyle. Ryan provides some key takeaways at the end of the article, for anyone interested in owning a small business. It all started when Ryan and his brother Kyle teamed up with their friends Tom Fujitani and Jium Lee, as they broke away from corporate America.The four founders of 8eighty first crossed paths a few years prior, while traveling overseas and collaborating on product development. Tom and Jium excel in understanding logistics, manufacturing and sourcing. Ryan says they also have a track record of demonstrating integrity, business savvy, a passion for the beach, and a sense of humor. Most important though, Dowd knows that his three business partners always have his back. 8eightywear.com is fueled by a team of innovative, fervent individuals who love developing products that solve problems for the surf community. Their mutual love of both the ocean and business, coupled with brains and fire are a perfect balance. But it hasn’t always come easy for Dowd. He is not a newcomer to the trials and tribulations of the entrepreneurial lifestyle. He admits that he’s knows all too well the sting of failure, and “stumbling your way to success.” Dowd launched his first start up in 1999, and in spite of a few rough patches, he didn’t give up. After launching or being a part of nearly a half a dozen companies, some that he says “failed spectacularly”, he has fine-tuned his natural entrepreneurial aptitude to help create a winning brand. He utilized the lessons he learned from past ventures, and combined those with astute strategic thinking, vision, diligence, long hours, print marketing, and what he calls an award-winning team. Their approach is focused on customer satisfaction, innovation and the relationships in and around the business. Overnight prints caught up with Ryan in between his juggling of international travel and business development, for a quick question and answer session. Overnight Prints: Ryan, with so many retail giants in the surf wear space, what fueled you to believe you could be successful? Ryan: We believe we offer the market something unique, and something the consumer is hungry for – quick reaction time. Some of the big manufacturers have become so large that even with very good teams and the best intentions; it’s next to impossible to respond quickly to their customers. We are small, nimble and focused. We do a lot of market research, and get out there with our target market as much as possible. If we come across a surfer who suggests a great idea, we’ll execute expeditiously, if our team thinks it makes sense. We are all about getting things done! There’s no red tape to deal with. And our clothing line is designed to be lightweight, flexible, breathable and extremely comfortable. We strive to offer a unique, high-value product, coupled with good, old fashioned customer service. Overnight Prints: Can you talk a little about your experience and passion toward “being in the trenches” before starting a business? Ryan: I did alright in school, but I’ve always been a doer. I prefer hands on experience over the classroom. I really need to get out there and experience it. I like to eat and breathe it, and understand the trials and tribulations first hand. Before starting a business, you have to be ready to dig in and get your hands dirty. If you want to open a coffee house, you need to work as a barista, and learn about the idiosyncrasies of your customers, and the unexpected challenges that every business owner faces. I’ve found that the best insights and advice often come from those who are talking to the customer’s day in and day out. Overnight Prints: You mentioned that your team beta-tests the apparel before you decide if you will move forward with the product. How do you go about that, and how helpful has it been? Ryan: The first mini-run of prototypes went to wear-testers. And their feedback was invaluable. They helped us understand whether our theories were practical and viable. They told us what it felt like to wear the clothing. We were able to enhance our line based on their feedback. Next, we went to the surf competitions, and talked with the surfers themselves, and if they were younger kids, we also listened to the parents. We showed them our line; let them touch the clothing and gear. We do this over and over and make sure the product is right. We also go to trade shows and visit accounts regularly to listen to retailers; their concerns and comments. Overnight Prints: When we spoke on the phone, you said you and your partners complement one another. Can you expand on that? Ryan: Even before working on this brand, my brother and I have been in business together since 2003. And while I’m a big picture guy, he’s great with details. Whether it’s remembering where we met someone or when a bill is due, Kyle’s attention to detail makes the business run smoothly. His decision making is typically slower, whereas I always want to move forward and progress the process. But, sometimes it’s best to take a deep breath, assess the situation and move forward accordingly. On my own, that wouldn’t happen as often. Overnight Prints: I think some of us think we have to do everything – even those tasks that we aren’t good at. What types of advertising do you do? Is one method more effective than others? Ryan: We’ve spent time with riders at surf competitions by sponsoring events and being present at these events. Just having our name and logo present isn’t really enough…but eye contact and conversations still matter, we believe. We also have some banner ads on the internet on selected sites. We’ve had great results with postcard marketing, and have a few magazines we’ve partnered with. We’ve used social media as a way to really connect and talk with our consumers, but once again, we listen. The “stickiness” of direct interaction takes a lot of time…but is probably the most effective. Overnight Prints: You seem to have quite a bit of business savvy. It seems that working and partnering across multiple functions and organizations comes naturally to you. What tactics would you say are most important in developing and sustaining a successful business? Ryan: First off, thanks for the compliment, but that’s up for discussion. At the end of the day, my acumen will be measured by what I accomplish and help others accomplish. That said, I feel that being able to analyze and recognize my own strengths and weaknesses, and those of my partners is imperative. Then, by asking “how can we get stronger…and better?” we can progress ourselves and continuously improve our brand. We need to remain humble and open to feedback while surrounding ourselves with seasoned, successful business people. If you are going to be in it for the long run, you need to be able to do the things that most people don’t want to do – get up earlier, stay up later and finish everything you start. Overnight Prints: What is the significance of the name 8eightywear.com? Eight is the atomic number for oxygen – it’s essential to life and stable. Eighty is the atomic number for mercury – it’s intriguing, mysterious and dangerous. 8eighty represents the balance of life – do you stay with what’s comfortable or take risk? How much risk do you take?? This is applicable in everyday life and on the ocean when surfing…the risk can yield big reward but can also yield disaster. Our mark goes along with this principle – there’s a balance to it and to life. Overnight Prints: Last question, what is your favorite surf spot – why? Ryan: Truth be told- I’m a pretty bad surfer, so designing product for those that can shred is a way of living vicariously through them. This is part of the reason I’m a designer. If you love being on the water, and I can help make your time better through a great piece of gear, I’ve accomplished something. BUT, the North shore of Hawaii has to be the best spot I’ve ever visited; the views, the color of the water and the waves are incredible. On the other end of the spectrum, New Smyrna, Florida is an amazing place because the community is such an important part of that beach…we’ve met some pretty great people in that area who have helped us quite a bit. Before starting a business, you have to be ready to dig in and get your hands dirty. If you want to open a coffee house, you need to work as a barista, and learn about the idiosyncrasies of your customers. You can learn strategy and theory from the most elite universities in the world, but there’s really nothing like getting into the trenches and doing the work. Get the hands on experience that you cannot learn in a book or classroom. Before you start selling a product a service, test it with target customers. Listen to their feedback and use it to improve your product. Partner with people that compliment you, don’t try to do everything yourself. One person is strong where another is weak. We all have limitations. Diversify your marketing. Combine traditional methods, like postcard with social media and interactive marketing. And get out there and talk to your customers. There is a time to persist. And a time to give up. If you wake up dreading the day, it might be time to pursue something new.